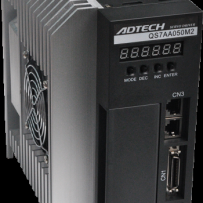 QS7AA050M is a universal servo drive product based on QS6 optimization and improvement, adhering to the Adtech QS6 series of excellent quality, more stable and more convenient. The QS7AA050M servo motor drive are more mature and stable with rich and complete data. New adding 485 communication function makes to connect with the upper computer software or controller more convenient and reliable..